Our goal is to serve our Lord in joyfulness by cleaning, organizing, and caring for his Holy Church here at Holy Ghost. Our work is not to be looked at as a job, nor a chore, but as an act of love. There are weekly duties and there are less frequent duties throughout the year. Whatever time and talents you have to offer are welcome! The choir rehearses on Wednesdays from 7:30 to 9:00 p.m. in the St. Cecilia music room downstairs. Call for more information. CCD is a religious education program for school-age children. All children not in parochial schools should attend these classes. Registration for CCD classes is held each year before the beginning of classes. We meet in the new Family Life Center (the “old church”) on Sunday mornings from 9:00-9:50 AM for Grades K-6. Our Middle and High School groups (grades 6-12) meet on Wednesdays from 7 – 8:30 PM. The Holy Ghost Council of Catholic Women (CCW) is an organization of the women of our parish. We encourage, strengthen and support one another as Catholic women in fulfilling our individual missions within our families, the Church and in the world. 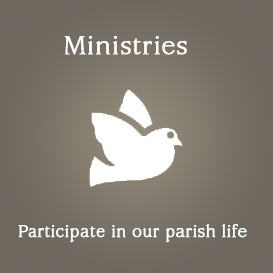 Our members are involved in numerous and diverse ministries within our parish and community. We work together to grow in spirituality and knowledge of our Catholic faith, support our parish and pastor, and enjoy fellowship with one another in the process! CCW unites us with other Catholic women of our deanery and diocese, our nation (NCCW) and the world (WUCWO). Upcoming meetings and events TBA via “Flocknote”. The council meets on the 2nd Monday of each month in the basement of the church. There is also a meeting of the Leadership Team on the first Monday of each month. All Knights are invited to attend this meeting as well. The council meets at 6 p.m. on the second Tuesday of each month in the John Paul II room downstairs. For more information, contact the church at 865-522-2205. Any member of the parish is invited to attend. The rosary is prayed for peace and an end to abortion after the 8 a.m. Mass on Saturday, in the church. For more information, contact the church office at 865-522-2205. RCIA is an adult preparation program for non-Catholics who wish to join the Church or are simply interested in learning more about the Catholic faith. We meet Sunday evening at 6:15 PM in the church basement. This needlecraft group meets Tuesday mornings from 8:30 a.m. till noon in the John Paul II room in the church basement.